Baked Cinnamon Crème Brûlée French Toast with Raspberry Preserves. 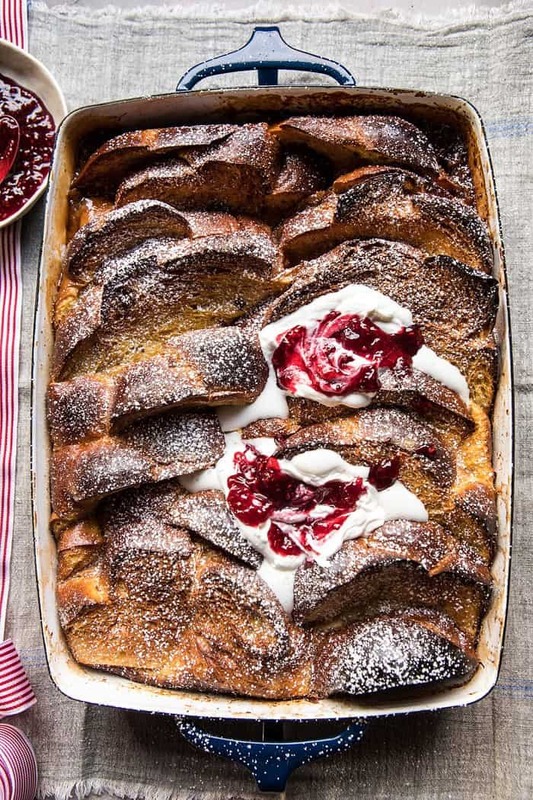 Brunching today with this Baked Cinnamon Crème Brûlée French Toast with Raspberry Preserves. 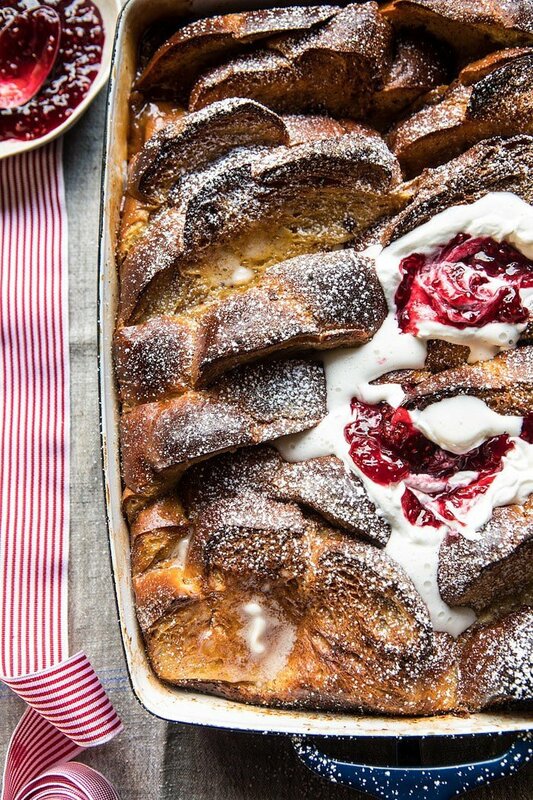 If there was ever a decadent french toast, this has got to be it. It’s pretty much one of the best holiday breakfast/brunch recipes you can find, and it’s delicious. My current state of mind, cooking wise, is prep all things ahead and bake later. This year I’ve made it a goal of mine to be more organized come Christmas Eve (I think I say this every single year though). Therefore, I’m on the hunt for recipes that can be prepared in advance. It seems every Christmas I’m frantically running around cooking, mixing up cocktails, and wrapping gifts. It’s basically full on chaos. I don’t hate it one bit, but there’s definitely room for some organization and make ahead recipes. K, cool. Let me tell you about this french toast. Here’s the quick story. Both my mom and oldest brother, Creighton love french toast. Every single Christmas Creighton will walk himself down to my house and request his annual French Toast breakfast, complete with bacon and a giant glass of milk (because apparently he’s still twelve years old). This breakfast doesn’t happen on Christmas morning since we always, always have Mom’s Monkey Bread, but more often it happens on Christmas Eve morning. To me, Christmas Eve is my favorite day and actually trumps Christmas Day. I love the excitement in the air, it’s the best. Because Christmas Eve is so special to me, I always cave in and make the boys whatever they request. It’s my sisterly duty, plus I’m just a sucker. Whenever anyone asks me to make something, 99% of the time I’ll do it…yep, people pleaser right here. Since it’s Christmas, you know I had to come up with a rather decadent French Toast. 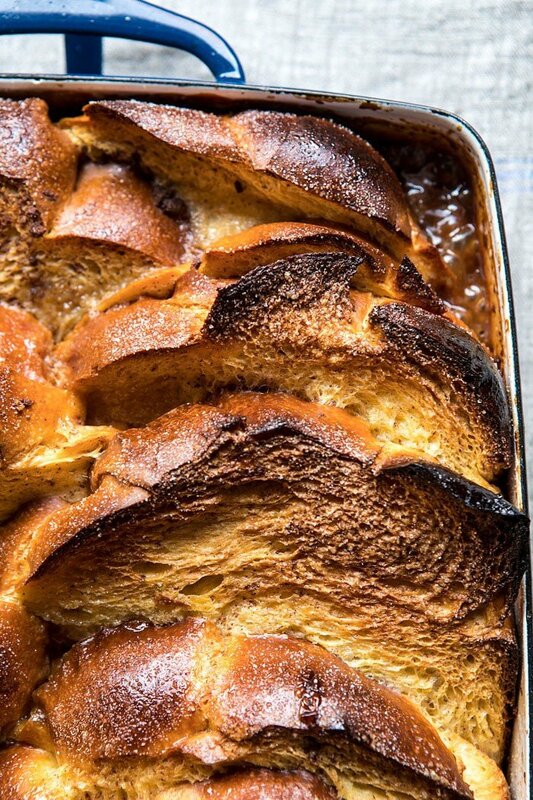 Enter this Baked Cinnamon Crème Brûlée French Toast. Oh my gosh, it’s heaven. No joke, it’s pretty much like eating dessert for breakfast, but hey, it’s the holidays, where anything goes so it’s cool. So what is Crème Brûlée French Toast? It’s toast that’s eggy, custard infused…with plenty of cinnamon and orange liquor, has a crunchy sugar bottom, and is topped with whipped cream and raspberry preserves. Pretty sure it just doesn’t get better than this. I served this up for Asher and I during our “Christmas Day” this past Sunday and the girl went crazy for it. Of course she doubled up on the whipped cream and skipped out on the raspberry preserves, but the little girl loved this baked French Toast and said that the just so slightly crunchy bottom was the very best part. The recipe is pretty simple. 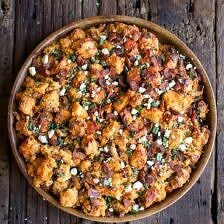 It’s a mix of maple, brown sugar, and butter, spread evenly in the bottom of a baking dish. This is the “Crème Brûlée” part of the recipe. The sugars then caramelize as the french toast bakes up in the oven and create a slightly crunchy crust over the bottom of the french toast. It’s literally just incredible, think Crème Brûlée topping on eggy french toast. SO GOOD. The custard is a simple mix of eggs, milk, cinnamon, orange liquor, and vanilla. I highly recommend using the orange liquor as it adds that touch of special holiday flavor. And truthfully, you really should have a bottle of orange liquor on hand at all times, especially during the holidays…so you can make these Cranberry Orange Margaritas. Once the french toast has been assembled, simply place it in the fridge for up to overnight. This is the perfect breakfast for early mornings when you don’t have time to cook. Simply remove from the fridge and bake. To add a pop of festive color, I like to serve this with some raspberries preserves, but, going to be honest here, it’s pretty delicious just straight out of the oven with zero toppings. 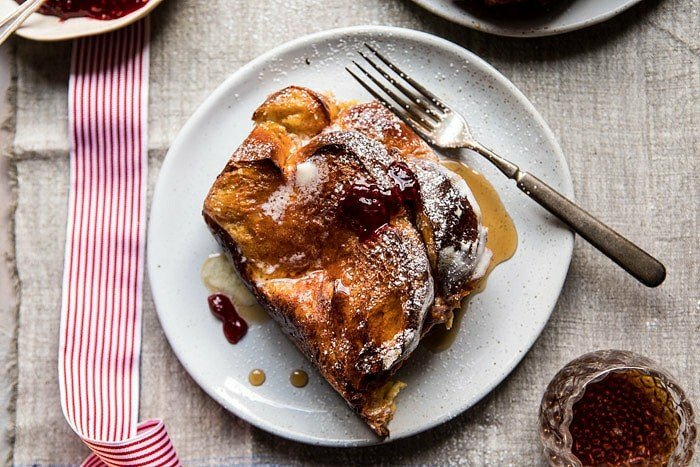 Maple and powdered sugar are really not even needed here, as the french toast is pretty sweet on its own, but of course do as you please and top as desired. This toast is eggy, custard infused...with plenty of cinnamon and orange liquor, has a crunchy sugar bottom, and is topped with whipped cream and raspberry preserves. Pretty sure it just doesn't get better than this! 1. Grease a 9x13 inch-baking dish with butter. 2. In a small bowl, mix together the maple, brown sugar, and butter. Spread the mixture in the bottom of the prepared baking dish. 3. In a large bowl, whisk together the eggs, milk, Grand Marnier, vanilla, cinnamon, nutmeg and salt. 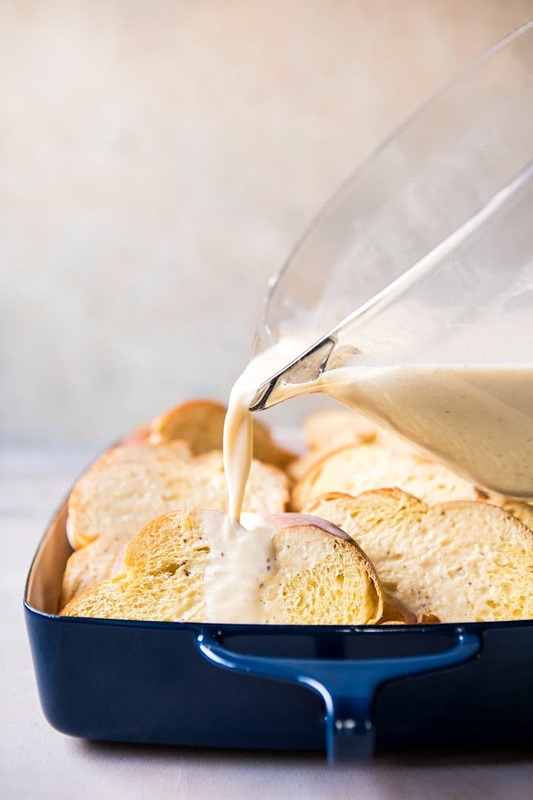 Submerge each piece of bread into the egg mixture, allowing the bread to sit at least a minute and soak up the eggs. Arrange the bread in the prepared baking dish. Pour the remaining egg mixture over the bread slices. 4. Cover and place in the fridge for 1 hour or overnight. 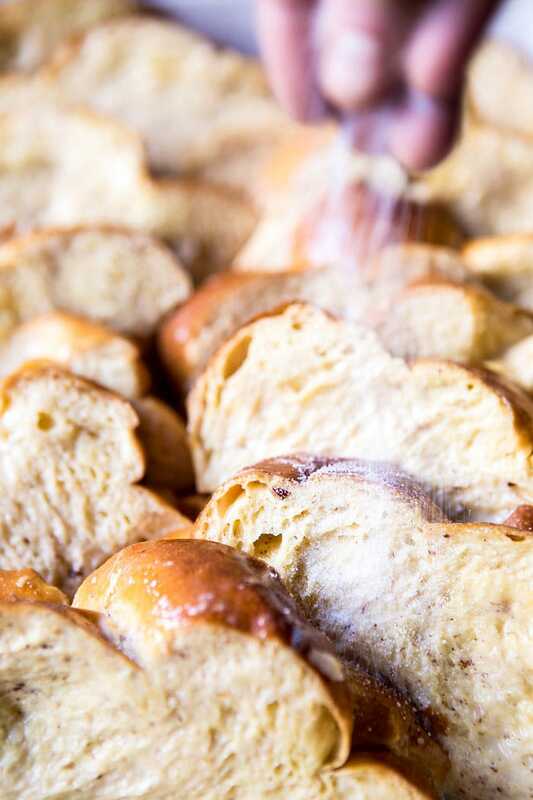 When ready to bake, preheat the oven to 375 degrees F. Sprinkle the sugar evenly over the french toast. Transfer to the oven and bake for 45-50 minutes or until the French toast is golden and crisp. If the tops of the bread begin to brown too quickly, loosely cover the French toast with foil. 5. Meanwhile, in a medium saucepan, combine the raspberry preserves and 1/2 cup water. Bring to a boil and reduce heat, simmer 5 minutes until warm. 6. 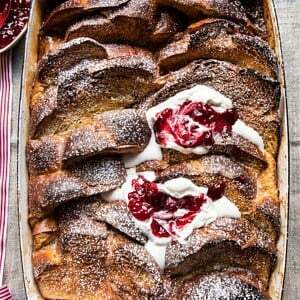 Serve the french toast warm, topped with whipped cream, if desired, and preserves. Enjoy! The perfect plate of french toast. Salted Caramel Chocolate Covered Pretzels. 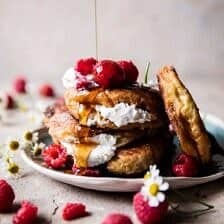 Raspberry Ricotta Croissant French Toast. 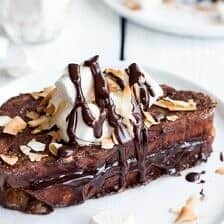 Best Ever Hot Chocolate French Toast. To replace 2 tablespoons of liqueur, use 2 tablespoons of orange juice concentrate or 2 tablespoons of orange juice with 1/2 teaspoon of orange extract. Cherry cider or black cherry, raspberry, boysenberry, currant, or grape juice or syrup. Substitute same amount of liquid as called for in the recipe. im nursing, so im either leaving liqueur out or using orange essential oil. congrats! 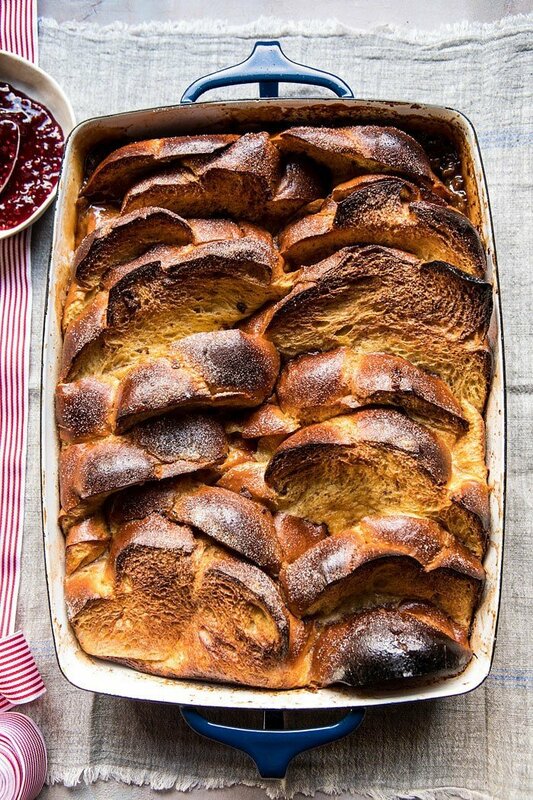 I’ve been on the hunt for the perfect Christmas morning baked french toast – thanks for posting! Can’t wait to make it. I hope you love this Brittany! Thank you!! 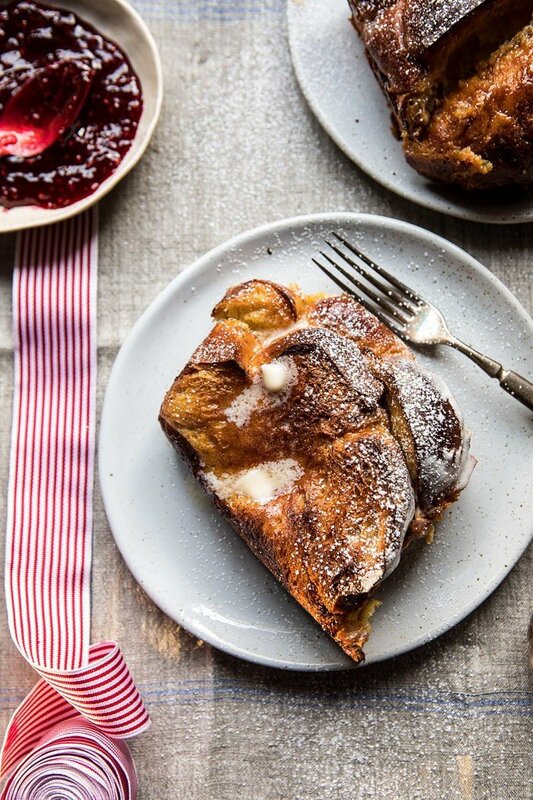 I normally like a savory breakfast over a sweet one; but let me tell you… this is my DREAM French Toast! So glad you’re loving this! Thank you Carrie! I want to come to your house on Christmas! I actually prefer Xmas Eve too. My family is European, and our tradition has always been to open presents on Xmas Eve after dinner. There’s just something magical about it and all the twinkling lights vs. waking up to open presents in broad daylight. I’m not a morning person so that’s also probably one of the reasons why Xmas morning really does not excite me at all haha. Haha would love to have everyone there! That is such a cute tradition, I love when its dark out and all the Christmas lights are up as well! Happy Holidays Natasha! Yum! How perfect for Christmas morning! I was looking for a make ahead French toast recipe! Thanks so much Tieghan, we love your recipes. The bread looks like a good 1/2 inch thick in the picture, you mention it should be 1/4 inch. Hi Laurie! Ya it could be anywhere from a 1/4 inch to a 1/2 inch! Either will turn out great! Thanks! I hope you’re enjoying all of your guests and the week leading up to Christmas! Do you have anything special planned? Or any last minute projects you want to get done? Hi Kristin! I am so glad you like this and hope it turns out amazing on Christmas Eve! I am enjoying a lot of my family members being home and can’t wait for them all to get in! I’ve just been super busy because of the holidays, but its been fun! How have you been? I hope the studio barn is coming along and you can give your family a mini tour while they’re there! So pretty, this is the perfect Christmas breakfast! I’m all for prepping ahead of time, especially when it has the chance to look like this! Thank you Matt! I am so glad you like this! I’m not sure if I can find Challa bread. What would be a good substitute? You can substitute the Challah bread with any type of brioche but I highly recommend Panetonne if you can find it. It comes out amazing! This is my favorite kind of holiday breakfast dish! Perfect with that challah. Happy Holidays to you and your family Tieghan! Thank you! Happy Holidays to you and your family Mary Ann! haha i just love your family stories. A french toast ritual at your house sounds perfect! Can I come this year? Of course lol! I am so happy you like my family stories Lindsay! love this! so delicious!!! and beautiful! If i don´t have maple syrup (it’s hard to find in Portugal) and the alchool you use there what can i substitute it with? In Portugal we have a tradicional dessert, thats very similar to this, and sometimes we use Porto Wine or Port Wine (vinho do porto), maybe i could use that? I seriously cannot wait to try this! Amazing flavors. I really want to make this for Christmas this year, but can’t find challah bread. Will it work to substitute French bread? Just made this recipe and followed it to the T, but the bottom did not come out crispy. What went wrong? Made this for this morning (Christmas Day 2017) for a bunch of picky eaters. I’m the only one crazed for french toast and this hands down was the best French Toast I’ve ever had!!!! Even Mom the pickiest of the eaters who doesn’t like french toast asked for seconds!!! Used the recipe exactly as is except for Cherry Preserves/Jam/Spread instead of the Raspberry. Will definitely make it again next year!!! That is AMAZING! So glad everyone enjoyed this and I hope you had a wonderful Christmas Lina! Thank you! 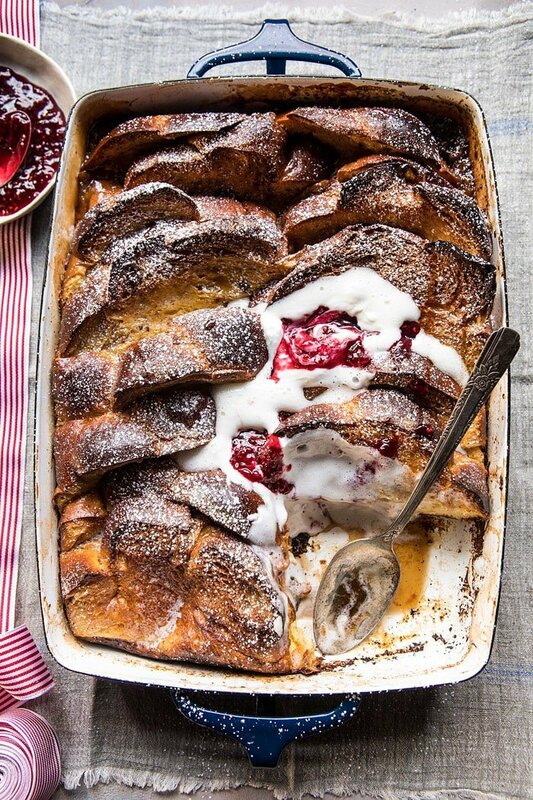 This overnight french toast was absolutely perfect for Christmas morning! I skimped a little on the brown sugar though because my family is sweet enough! I used orange juice instead of the Grand Marnier cuz that’s what I had. So easy—-so delicious! I am so happy you enjoyed these Debra! Thank you! This was a great hit at my house Christmas morning. It went FAST, no leftovers! Thank you, really love your recipes and I wish you a Happy New Year. That is so great to hear! Thank you Robin! I hope your Christmas was amazing and Happy New Year! I made this Christmas morning for my family and it was a hit! My dad is a pretty healthy eater so I had to sell him on how it was filled with protein filled eggs and cinnamon, but he gobbled it right up along with my brother, sister, and mom! Although this dish was delish, and i love the holidays, I’m thrilled it’s healthy January on your blog! I don’t know about you, but after about a month of indulging like crazy on sugar and carbs, I’m ready for some yummy veggie and superfood recipes. One thing I really miss… your 9 favorite things posts! And even more… how you used to give a “preview” of the upcoming week’s recipes!! Can we get those back? Thanks for all the inspiration and fantastic posts! Hey Libby! I am so happy you and your family enjoyed this recipe so much! Don’t worry, the Nine Favorite Things posts will be back soon! Thank you!! BF expects this every Sunday morning now. 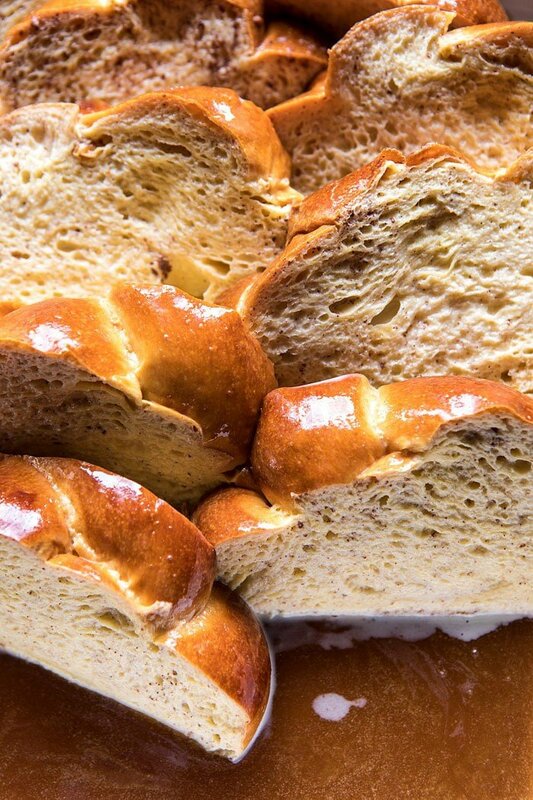 I make it with your brioche. I do the cinnamon swirl but not the strudel. Its our Sunday brunch we look forward to every weekend. Haha that is amazing! I am so glad you both love this recipe, Ginger! Thank you! Hi Elise! 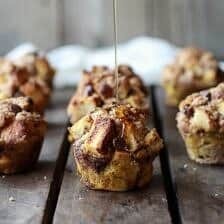 I am so happy that these turned out amazing for you and your guests! Thank you! I always enjoy your recipes! Everything is so good. I’m planning to try one of your French Toast recipes for Easter. I noticed you have this baked French Toast or regular French Toast that you book on the griddle. What is the difference between baking in the oven or cooking on the griddle? Is texture different? I like fluffy inside and crispy outside. Any recommendation? This sounds delicious. I am hosting my adult son’s childhood friends and their spouses this weekend. Can I double the recipe? If so, what size dish would you use and how long would you bake it? Thanks. OH MY SWEET LORD, Tieghan. We made this for New Year’s Day brunch and it was phenomenal. So easy to make the night before. Everyone from my picky grandma to picky 4 year old niece was a fan. A new tradition for sure! Happy 2019! Thank you so much Madeleine! I am so glad you loved this recipe!! Hey! If someone didn’t find this receipt until an hour before dinner, and wanted to omit the extra hour in the fridge, would it be that big of deal? Asking for a friend. Hahaha.